August 02, 2017, may very well go down in my memory bank as the most significant day in my career as a leader. 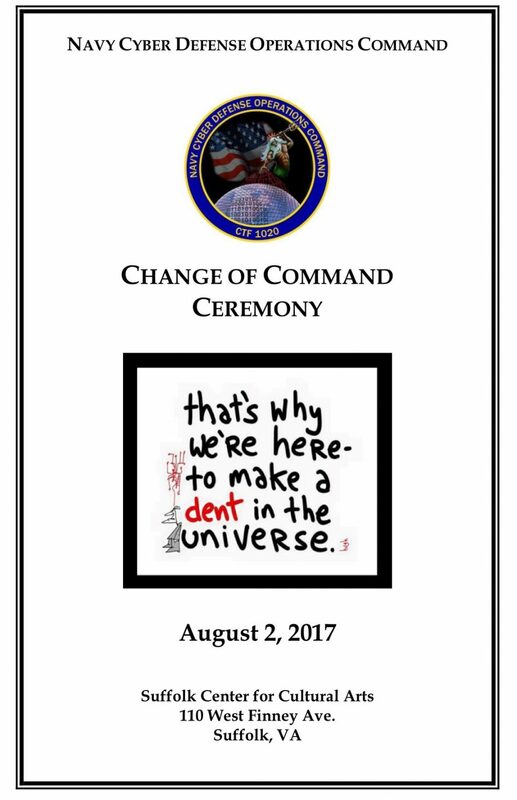 It was the day we turned the Navy Cyber Defense Operations Command Change of Command ceremony into a celebration of an amazing team and the culmination of a truly significant chapter in the Command’s ongoing story. Planned by our First Class Petty Officer Association and volunteers from across the Command, it included the customary traditions and so much more. Here is an article that documents the occurrence largely for the record, but those who were there will remember it as being so much more. There is no way for me to do it justice using words alone and I am certain the videos will be shared appropriately (very soon), so I will merely share a link to the program and my remarks below. As I read them both yet again, I can’t help but smile as I reflect on the outcomes we generated, the environment we created, and the teammates who made it all happen. And as we contemplate the impact we had well beyond our Command, this video of a team that has taken a side project and made it their main effort is one of the nicest thank yous I have ever received. 727 days ago I shared a stage much like this one with Captain Doug Powers. It may sound odd, but as I stood on the stage that day (07 August 2015), I was not completely in the moment. I was envisioning the future. Like some of you are right now, I did my fair share of daydreaming on that stage. It wasn’t that I was overlooking the significance of that day, but I was scanning the audience attempting to make eye contact with each of the many unfamiliar faces that made up Team NCDOC. I was thinking about all of the fun we would have as a team. I was thinking about how these strangers I had yet to meet were going to be the focus of my life for the foreseeable future. People I didn’t know, yet teammates with whom I felt a common bond. People who I was going to make it a point to make saying goodbye to difficult. For it is the void we feel when we bid farewell that serves to measure the value of our presence. Those who know me are aware that I am hyper conscious of time and that I enjoy reading (but only non-fiction). The way I see it, our lives, much like books, are broken into chapters and the military makes sure those chapters are 2-3 years long. When we drive to California as a family next week, my 14 year old-son Barrett will close out his 7th chapter, while Marianne and I will close out our 11th. Today, NCDOC, which has a storyline that is almost 12 years old, and using changes of command to symbolize the transition from one chapter to another, turns the last page of Chapter 6. Before I talk about Chapter 6, let me welcome the lead writer for Chapter 7, Captain Julia Slattery. Last September, I was able to serve on the selection board that picked our next group of Commanding Officers. A board that selected both Slatterys. Julia’s husband Chris assumed Command of NIOC Norfolk last Friday. Once the results were finalized and before selectees were even notified, my lobbying for the right leader to relieve me commenced. I have long admired Julia and knew she was the one to whom I wanted to pass the baton. She is the leader best equipped to help NCDOC build upon the previous six chapters. She was the one I personally asked VADM Tighe to have relieve me when the time came. Funny thing is, I tried the same thing a few years ago when I was advocating for my relief at NIOC Pensacola. I lobbied hard for “The other Slattery” Chris…I guess I overplayed my perceived level of influence. The NIOC Pensacola Team didn’t get Chris that time around, but I am so pleased we got Julia and you will be too. Teammates I will assure you that there will be no decrease in positivity, energy, engagement, and focus. Buckle Up! Chapter 7 is going to be even more amazing. Ok, now back to chapter 6. The theme for this chapter has been that of creativity, critical thinking, and collective ownership. Prior to this job, I had the pleasure of working directly with Admiral Mike Rogers. His final words of advice to me before I left his office and began the transit to Suffolk was, “Sean, I know you are a process guy, but remember it’s all about outcomes.” Yes, he knows me well and yes, I agree with his assessment. It is all about outcomes. And it is the process that generates the outcomes. It is the environment that informs the processes. And it is the people who shape the environment. My role here was not to generate outcomes, nor was it to dictate processes. My role was to attract talent, inspire teammates, and foster a culture where even (and at times especially) our most junior teammates were the ones generating those outcomes. To borrow a phrase from our Illuminate Teammates, my job was merely to provide the team with the time, trust, and top-cover necessary to do their part. It has been counter to the traditional military mindset and it has made some very uncomfortable. But as that first piece of art (a gift from my Mom and Dad) I hung on the wall in my office clearly communicated to new check-ins, “Get comfortable being uncomfortable.” I will freely admit that I was uncomfortable most of the 727 days we shared. And I am far better because of it. I trust I was far from alone. I am not going to talk about the outcomes we generated. Those of us on the team are aware of them and absent the proper context it would be unfair to our guests to mention each. Instead, let’s acknowledge the things we did to enable those outcomes. Let’s focus on those things that are truly remarkable in a way that is consistent with our “Yes, And” approach to everything we do. Yes, we are the only command in the Navy that has a culture club focused on shaping our environment. And Yes, we have a makerspace. And Yes, we are making design thinking a core competency. And Yes, we use comedic improvisation classes as a means of developing leaders and strengthening teams. And Yes, we play video and board games in the Hall of Heroes. And Yes, we conduct yoga classes in the same. And Yes, we have junior teammates serve on hiring panels to help ensure we hire the right seniors. And Yes, we have a new teammate handbook modeled after the computer gaming company Valve. And Yes, we have a mentorship program modeled after the NFL draft. And Yes, we take the game Jeopardy to the next level as a means of growing our knowledge. And Yes, we have an Innovation Cross-Functional Team that turns good ideas from passionate teammates into reality. And Yes, we do our best to recruit specific talent in rather creative ways. And Yes, we watch TED Talks at command quarters. And Yes, our social media presence is uniquely ours. And Yes, we host a Developing Leaders Guest Speaker series for all Hampton Roads IW commands to benefit from. And Yes, we have built amazing defensive cyberspace operations capabilities on our own initiative using internal talent and leveraging strong partnerships we have created. Yes, we are a military command. And Yes, we are so much more. Yes, we are different not for the sake of being different, but because our mission requires us to be. Yes, we creatively solve problems. And Yes, we are critical thinkers. And Yes, we share ownership as a collective. And as many operational commanders have personally witnessed during named operations that we have led, the outcomes we generate are pretty darn amazing. People shape the environment. Environment informs process and process generates outcomes. Ultimately, it is all about outcomes, but outcomes don’t generate themselves. I mentioned the theme of chapter 6 as being creativity, critical thinking, and collective ownership. But there was one theme that we didn’t talk about regularly yet drove me (and many of you) day in and day out. And that is love. Yes, I said it…”The L word.” 727 days ago I committed to this team. As a child, I lived in a home where the words “I Love You” were said regularly. As a husband and father, I live in a home where the same is true. As a leader, I don’t use the “L word” at work, but I hope my actions communicated my feelings about each of you and our shared team. Let there be no doubt teammates, I love each and every one of you. I thank my senior leaders for giving me the opportunity to lead with you. I thank each of you for the opportunity to learn from you. I thank Marianne and Barrett for being understanding of my commitment to this team which at times took precedence over even them. And I thank teammates, Tidemates (my son’s swim teammates), friends, and family for choosing to be here today. It’s not often in life that we know we are doing something for the last time. And as I look across this team for the last time, I am prideful of our past and excited for your future. Sir, I was inspired working with you and the amount of strange ideas you let us try out. I still tell people about the game day that you let us have in the hall of heroes even though almost nobody believes it. My time serving with you is my most cherished time in the Navy because of how much importance you placed on letting the Junior Sailors like myself develop the way ahead. I hope that I will get to serve with you again at some point in my career. Fair winds and following seas. Thanks, CTN1. Keep making amazing things happen…we are counting on you! NCDOC Alums…changing the Navy day by day. This is really good stuff skipper. Keep up the good work.